Veeps: Profiles in Insignificance » Is There A Doctrine In The House? Fortunately, the country hasn’t promised her a Rose Garden yet. Team McCain, Sarah Palin’s advisers, and even many of her Democratic detractors have been deliberately setting the bar low for her these past few weeks, lest she happens to somehow sail over with ease and look like Jackie Joyner-Kersee. Apparently they didn’t set it low enough. 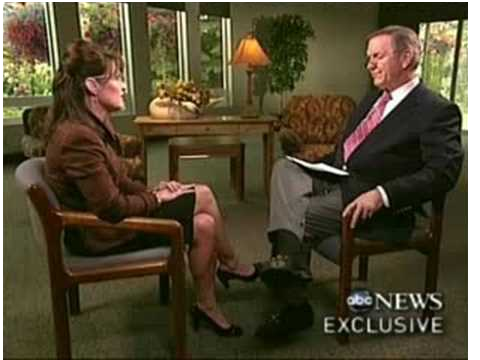 No one expected anything of tonight’s Charlie Gibson interview of Governor Palin on ABC, but even before the world got a chance to see it, headlines were already leaking out indicating a performance that fell somewhat short of Margaret Thatcher and looked at times eerily like Dan Quayle knocked around one too many times and with something to prove. I’ll be watching tonight when I get home, but every time I pulled up my browser at work there was a new blunder trumpeted in large-point type. She claimed that she would “never presume to know God’s will.” Unfortunately, not once, but twice in a speech this year she urged the graduating class of seniors at the Wasilla Assembly of God, to pray “that there is a plan (in Iraq and Afghanistan) and that that plan is God’s will.” As long as her audience was at it, they should also pray for God to throw a little gravy Alaska’s way and see that their $30 billion gas pipeline be completed. “I think God’s will has to be done in unifying people and companies to get that gas line built, so pray for that,” she said. The prayer for the soldiers was standard, government-issue political oratory, but exhorting the kids to pray for the gas pipeline because it’s allegedly “God’s will” was bringing her faith to the realm of the comforts of the mortal, and sending the implicit message to the graduating class of 2008 that you could also petition God for a new Ford F350 or perfect 74 degree weather on your birthday. She may have decided, though, that it would have been unseemly to pray that it was God’s will that her state trooper ex-brother-in-law, Mike Wooten, die in a hunting accident. Gibson finally had to explain precisely what the Bush Doctrine was, and asked her specifically if she agreed with it. She stopped short of agreeing outright, but insisted that if there were strong enough intelligence that we were in danger, then we had the right to defend ourselves. Hardly an unequivocal yes, but at least he finally brought her around to the crux of his original question. What was a little more concerning was her response to Gibson’s line of inquiry about what made her a Russian expert. She cited John & Cindy McCain’s flaccid claim that she was better versed to understand the slightly-less-evil-than-it-used-to-be empire because she can see them in their parkas across the Bering Strait. When Gibson asked her if the U.S. would have to go to war with Russia if they invaded Georgia again, she shrugged and essentially posited that we’ve got to do what we’ve got to do. “We’ve got to keep an eye on Russia. For Russia to have exerted such pressure in terms of invading a smaller democratic country, unprovoked, is unacceptable,” she told Gibson. Well, I’m all for it. After all, we have to do something with this military of ours. We can’t just have them sitting around doing nothing and getting paid for it. This would all be very amusing if this were just a theoretical election or something out of Michael Moore’s Canadian Bacon 2, but this is real, and someone’s going to be President on January 20, 2009. John McCain isn’t exactly bursting with vitality and no one in international betting circles is taking the over on how long his position as President will be something other than prone. There’s a very real possibility that before next September rolls around, Governor Palin could not only be picking out White House drapes, but Supreme Court Justices. Regardless of your politics, this should concern you. Abject terror knows no political party. We should all hope that this is a tipping point and that otherwise reasonable adults who have temporarily taken leave of their senses will run from the McCain-Palin ticket as if it had a chainsaw and a leather death mask. After all, the best time to get buyer’s remorse is before you’ve laid down your credit card.